The Hockey Show, Canada's only campus-produced radio show that strictly talks hockey, had a solid show of facts, figures, and information to relay to the millions... AND MILLIONS... of the show's fans, but then something happened. Something awesome happened. Beans and I were contacted by a couple of rather special people who have done some rather incredible things this year, and we decided to bump the facts, figures, and information to another week. I'm thinking the powers-that-be at UMFM need to give us a second slot in the program grid to fit in all our hockey stuff, right? We'll get through Jeff's Survivor exit interview to close off Round 2 because we've been dragging that out for the last few weeks before turning our attention to the two incredible people pictured to the left. The Hockey Show is honoured, proud, humbled, and privileged to welcome back to the studio two of our favorite guests in Brandon Reid and Jessica Scott-Reid! As you may recall, Brandon coached the Metal Ligaen's Aalborg Pirates for the last few seasons, so we'll have lots to talk about after he and the team went off and won every trophy that the league put up for grabs this year! We'll also talk about what the future holds as news broke a few weeks ago about Brandon moving to a new team and location, some of the guys he recruited and coached over in Denmark, and what he's going to miss about Aalborg! We'll get Jessica's thoughts on all that, and catch up with her as she's becoming one of the world's most prominent vegan journalists, find out how Clover and the pups are doing with all the moves, and everything else happening around the new move to the new city! It should be a fun night of chatting, so make sure you tune in at 5:30pm CT! I can hear some of you saying, "I know them and I want to listen!" Well, the easiest way is for you to download the UMFM app on your phone or tablet. It's literally the easiest and most convenient way to listen to any of UMFM's great shows any time of the day, so go get it! Just follow this link on your iDevice or this link for your Android device and get the UMFM app! It's never been easier to tune into The Hockey Show or UMFM! Download the UMFM app today, and don't miss any of our great programming or shows! Of course, you can do the radio thing at the 101.5 frequency on the FM dial and you can always listen online via the UMFM website as well! Tonight, Beans and I welcome back Brandon Reid and Jessica Scott-Reid to the studio as we learn all about hockey in Europe, moving to new places in Europe, and life in Europe only on The Hockey Show found exclusively on 101.5 UMFM, on the UMFM app, on the UMFM.com web stream! If you're a fan of the Vegas Golden Knights, the image to left is one you never want to see. That's Jonathan Marchessault after taking a blindside hit from Washington's Tom Wilson, and it was a relief to see Marchessault back on the ice after spending some time in the quiet room. I've watched this hit over and over last night and through today, and I question what goes through Tom Wilson's head. While this hit wasn't as dirty as the one he threw on Pittsburgh's Zach Aston-Reese, there's still a lot needing examination regarding this play. We'll break it down here, and decide whether or not Wilson will receive a fourth suspension this season. Let's start with the video of the hit in question. There's a lot to unpack here, so let's start working through this as objectively as I can. This is Tom Wilson, after all, so there might be some subjective feelings that creep into this examination. First, it's pretty clear to see that Tom Wilson's point of contact on Jonathan Marchessault was the shoulder. There is nothing wrong with a shoulder-on-shoulder hit despite how violent it may appear. Shoulder-on-shoulder is legal at any level of hockey, so it doesn't even meet the standards of a penalty based on the initial point of contact. Second, Wilson did hit Marchessault on the blindside, but has that ever been a penalty? Not that I can recall. As long as the hit is legal, a blindside hit is unfortunate but not illegal. It was shoulder-on-shoulder, as established above, but Wilson caught Marchessault watching his pass. That happens, it has happened in the past, and it will most likely happen again. Third, you might be able to assess a charging penalty to Wilson based on the bee-line he made towards Marchessault from the distance at which he started, but he didn't leave his feet at the moment the hit was thrown. Unless the officials were watching his movements as he came back into the play, a charging call would be tough to justify on the ice. At worst, the hit is a minor infraction, so it's not like that will be discussed at the Department of Player Safety. In this case, there was no call nor was there any need to review the hit. Finally, some have said the hit was late. I can see where that is coming from, and Craig Simpson of Sportsnet stated as much on the video. The problem is that it isn't that apparent in full speed. Yes, it comes after the puck has left Marchessault's stick, but it doesn't appear to be as late as it looks in slow-motion. Call me crazy, but I don't see the hit as being gratuitously late. As I've tried to prove with the four pieces of evidence above, I don't think there's anything that is so egregious that Wilson deserves punishment from the Department of Player Safety. Watching the hit over and over in full speed, you wonder why Tom Wilson would put himself in that kind of situation after he has already been suspended once in this year's postseason, but he seems to have walked that fine line between legal and illegal very carefully on this hit. I'm not convinced that Tom Wilson has learned his lesson after three suspensions this season, but I can't find any reason why he should be suspended a fourth time after this hit, and it seems the NHL feels the same way as there will be no supplemental discipline for Wilson. There will be no absolution for past sins with Wilson when it comes to the NHL, but you have to think the NHL will be keeping a closer eye on Wilson if he's going to try and test his boundaries once more. A leopard cannot change his spots, so it's likely a matter of when for Wilson when it comes to him sitting again. It just won't be for the hit last night. In what is nearly a lock to happen this summer when the Board of Governors meet and vote on it, NHL expansion to Seattle won't be the first time the NHL has ventured into the Emerald City. While both the Vegas Golden Knights and the Washington Capitals prepare for Game One tonight as both teams look to etch their names into the Stanley Cup for the first time, Seattle has already done that in its past. 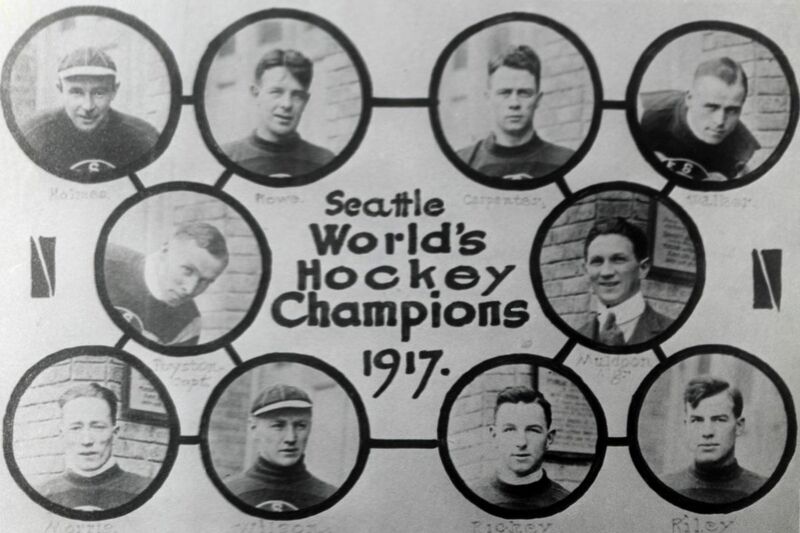 As seen in the photo above, the Seattle Metropolitans were the 1917 Stanley Cup champions before returning to the Stanley Cup Final in 1919. It is this year - 1919 - that we'll look at in terms of what happened when the Stanley Cup officially was not awarded despite there being no work stoppages and having two teams that qualified to play for the Silver Chalice! 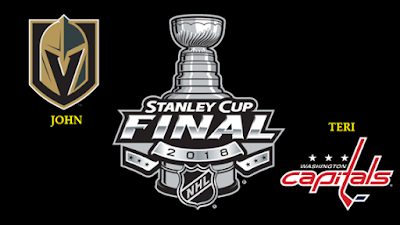 From 1917 until 1924, the champion of NHL's playoff system would meet with the winner of the Pacific Coast Hockey Association's champion in a series to determine the Stanley Cup champion. Among the various teams that would be part of the PCHA were the Seattle Metropolitans, Vancouver Millionaires, Victoria Aristocrats, New Westminster Royals, Victoria Senators, Victoria Cougars, Vancouver Maroons, Spokane Canaries, and the Portland Rosebuds. The PCHA, started by Frank and Lester Patrick, were highly successful despite the small number of teams, and they would develop some of the best players seen during that era such as Cyclone Taylor, Hap Holmes, Tommy Dunderdale, and Bernie Morris. Needless to say, this west coast professional men's league was seen as equals to the NHA and NHL at the time. In 1919, the Montreal Canadiens earned the right from the NHL's membership to play for the Stanley Cup after defeating the Ottawa Senators in five games in their best-of-seven series. Ottawa's star player in Frank Nighbor missed the first three games - all of which Montreal won - before returning in Game Four to help Ottawa to a 6-3 win on home ice. However, the return to Montreal for Game Five saw Les Canadiens win 4-2 to earn the right to meet the PCHA champion. Seattle, in a bit of a twist, met the Vancouver Millionaires in a total-goals two-game series for the right to play for the Stanley Cup. Seattle blitzed Vancouver in Seattle 6-1 in the first game where Vancouver was down dynamic scorer Mickey MacKay due to injury. The Millionaires needed a major push with the second slated to be played in Vancouver, and the Millionaires responded with a victory. The only problem? They won 4-1, so Seattle would advance to play for the Stanley Cup due to their 7-5 advantage in total goals over the two-game series. The Metropolitans and Canadiens would meet for the Stanley Cup for the second time in their histories. The Metropolitans had won the Stanley Cup over the Canadiens 3-1 in a best-of-five series in 1917 to claim the title of "World's Hockey Champions" as seen in the lede photo, so there was already some history between these two clubs. The best-of-five series began on Wednesday, March 19, 1919 in Seattle, Washington where all five games were scheduled to be played due to travel distances between the two cities. With Montreal at a bit of a disadvantage without their home crowd to cheer them on, this series already looked troublesome for les bleus-blancs-et-rouges. That March 19 game was decidedly one-sided as Seattle thumped Montreal 7-0 in the opening game. Hap Holmes was brilliant in the Seattle net in stonewalling the Canadiens, and the legendary Frank Foyston scored in each period on Georges Vezina to pace the Metropolitans to the win. The game, incidentally, was played under the PCHA rules which featured seven skaters aside. 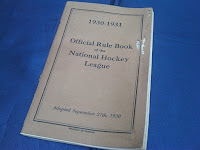 The NHL, in 1919, had already reduced the number of skaters on the ice to six - no rovers in the NHL - so this game not only featured teams from two leagues, but rules from two leagues! And those rules would come back into play in a future game as well! March 22 saw the Canadiens suit up as the home team, and they played their six-man game much better than the seven-man system days earlier. Newsy Lalonde put the Canadiens up 1-0 midway through the first period before adding two more goals in the second period and a fourth goal at the midpoint in the third period to stake the Canadiens to a 4-0 lead through 50 minutes of play. Bobby Rowe would score at 11:03 and Frank Foyston added another Seattle goal just eight seconds after Rowe's marker, but Georges Vezina would allow no other pucks behind him as Montreal evened the series at 1-1 with a 4-2 victory! Game Three was set for Monday, March 24 with Seattle reverting back to the home team and the game being played under PCHA rules. With the changes, Seattle once again was the better team by a large margin over the Canadiens. First-period goals by Frank Foyston, Foyston again, Cully Wilson assisted by Foyston, and Foyston a third time had Seattle up 4-0 by the time the first intermission rolled around, and the Metropolitans were on cruise control for the remainder of the game. There was no scoring in the second period, but Montreal's Odie Cleghorn and Louis Berlanquette cut the deficit in half with seven minutes to play in the game. Five seconds after Berlanquette's goal, however, saw Foyston score his fourth of the game, and that was followed up by two more Seattle goals off the sticks of Muzz Murray and Roy Rickey as Seattle skated to the 7-2 win and, more importantly, the 2-1 series lead that left them one win away from their second Stanley Cup! The fourth game, played on Wednesday, March 26, was unlike the rest. Montreal was the designated home team so we were back to six skaters on each side, but this game saw none of the skaters outside the goaltenders have an impact. Through sixty minutes, the two teams remained knotted up at 0-0, so we'd need our first taste of overtime in this series to see if Seattle was going to celebrate or if Montreal lived to play another day. The NHL rules stated that there were two ten-minute overtime periods to be played with a winner being crowned on a sudden-death goal, but both Georges Vezina and Hap Holmes would not allow a goal in the additional twenty minutes of play. The game was ruled a tie at that point, pushing the series to 2-1-1 in favour of Seattle. Both teams took issue with the tie as both squads wanted a win. Montreal insisted that the NHL rules be used where a tied playoff game was replayed in its entirety. Seattle insisted that the PCHA rules be used where total goals to that point would be used to determine a winner. It was finally determined, however, that there would be no winner with two drastically different sets of rules in play, so it remained as a tie officially. However, it was also determined that overtime would continue for as long as needed until one of the two teams scored in future games. Officially, this would be the last tie game in the playoffs for the NHL. Game Five would be played on Saturday, March 29 with Seattle as the home team and the game being played under PCHA rules. Things looked similar to Games One and Three with Seattle jumping out to a solid first-period lead with Frank Foyston and Jack walker putting the Metropolitans up 2-0 through twenty minutes of play. Walker would add his second of the game early in the second period to make it a 3-0 Seattle lead, and there had to be some worry on the Canadiens' side at that point. However, the ice began to tilt back in Montreal's favour as they figured out this seven-man game midway through the second period. Montreal started carrying the play as it appeared some of the Metropolitans were tiring, and this proved to be a confidence-builder for the Canadiens despite them trailing 3-0 through two periods. Four minutes into the third period, Odie Cleghorn found room past Hap Holmes to make it 3-1. 1:01 later, Newsy Lalonde found the back of the Seattle net to make it 3-2! As the game moved along, it appeared that Montreal defender Joe Hall was laboring, and he eventually left the game citing "illness" as his reason. After getting a replacement player for Hall, the Canadiens found the tying goal with less than three minutes to play when Newsy Lalonde sniped a goal past Holmes to make it 3-3! That score would carry through to the end of the sixty minutes of regulation, so we'd need overtime to settle this game! Just as they did in Game Four, the two teams went back and forth with little to show for it until late in the first overtime period. At the 15:51 mark, Montreal's Jack McDonald fired a puck that eluded the pads of Holmes, and Montreal would celebrate in forcing a deciding game with the 4-3 overtime win to even the series at 2-2-1! While it would officially be the sixth game of the five-game series for the Stanley Cup, these two teams would clash again on Tuesday, April 1! Following the game, Joe Hall's illness got progressively worse as the night wore on. He developed a fever and was in some discomfort, so the Canadiens had him moved to a Seattle hospital. Other members of the Montreal Canadiens began to show similar symptoms to that of Hall on Saturday night as well. Of note, Newsy Lalonde, Bill Coutu, Jack McDonald, and manager George Kennedy all showed worsening conditions as the night wore on. McDonald was sent to the same hospital by Sunday morning as Hall, and it was apparent that fielding a team for Tuesday's game was in doubt. By Monday, Louis Berlinguette were added to the list of players showing fevers between 101°F and 105°F, and he, along with Lalonde, Coutu, and George Kennedy, had been isolated in their hotel rooms by doctors with what they were categorizing as influenza. Kennedy had reached out to Seattle and expressed that the Canadiens could field a team with players from nearby Victoria, but PCHA President Frank Calder balked at this idea. The Metropolitans also weren't satisfied with the idea of Montreal forfeiting the game due illness as that was out of their control, so the Metropolitans declined that option as well. In short, Seattle wanted to play the Montreal Canadiens, but it looked more and more like the deciding game of this Stanley Cup series was in serious jeopardy. On Tuesday morning, arena workers at the Seattle Ice Arena were told to "strip away the temporary ice sheet from the arena in downtown Seattle, and instead begin laying the foundation for a roller rink", according to Sports Illustrated's Alex Prewitt. That would be an odd request with the Stanley Cup's deciding game set to be played there, but the announcement was made at 2:30pm Pacific time that the deciding game in the series was being canceled due to the influenza outbreak. The Spanish Flu, as it was colloquially known, infected some 500 million people around the world between January 1918 and December 1920, resulting in the deaths of 50 to 100 million of those infected. One of those people who passed away from the Spanish Flu was Montreal Canadien Joe Hall who died on Sunday, April 5, 1919 at the 3pm at the Columbus Sanitarium. Hall was born in England, but immigrated to Canada as a youngster with his family where they settled in Brandon, Manitoba. He played for the Stanley Cup in 1904 as a member of the amateur senior men's Winnipeg Rowing Club team against the Ottawa Hockey Club who won the best-of-three series 2-1. It wouldn't be the last time Hall would play for the Stanley Cup, though. Hall won the Stanley Cup with the Kenora Thistles in 1907 before moving to Houghton, Michigan. He'd find himself in Montreal where he played with the NHA's Quebec Bulldogs, winning two more Stanley Cups in 1912 and 1913. From there, he lived in Edmonton before landing back in Montreal, finding some stability when he joined the Canadiens as a fiery defender who often came to the aid of teammates who were under siege from opponents. Hall's temper would lead to him leading the NHL in penalty minutes in 1917-18 with 100 PIMs followed by a staggering 135 PIMs in just 16 games in 1918-19! In the end, the Stanley Cup went back east to the NHL with no official winner in 1919. Both the Seattle Metropolitans and the Montreal Canadiens are listed on the 1919 section of the Stanley Cup. but both teams finished with a 2-2-1 record in that series. Kennedy had tried to give the Stanley Cup to the Metropolitans following the series, but the Metropolitans refused to accept it and they didn't contest the decision to have it remain in the east after Toronto had won it in 1918. For an entire year, there was no Stanley Cup champion - something that wouldn't happen again until 2004-05. At the start of the CHL season, the three leagues had their favorites as to who would be traveling to Regina, Saskatchewan for the 100th Mastercard Memorial Cup. The perennial powerhouses would be mentioned. The slight underdogs would be given a nod. The host team in the Regina Pats impressed pundits. It would be none of these teams who would emerge the victor in the end. When all was settled tonight, though, the league's smallest-market team would stand above the rest in capturing their first Memorial Cup in franchise history! In living in one of the NHL's smallest markets in terms of population, there's always this stigma that the team is fighting the current as it makes its way upstream alongside the teams in major NHL markets. The great equalizer, though, is that the team's ownership and management have to be on the same page in making moves and decisions that even the odds regardless of the amount of fan support. 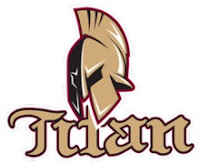 Winning is the key to bottom-line success in all levels of hockey, and the Acadia-Bathurst Titan leveled the playing field with shrewd player moves and an ownership group set on seeing Titan hockey thrive and survive in New Brunswick. The Titan are owned by a group of 28 people that includes steel industry businessman Leopold Theriault, Darryl Stohart, and Philadelphia Flyer Sean Couturier. Theriault sits as the chairman of this ownership group, and he and his partners have ensured that the Titan will remain in Bathurst for the foreseeable future after years of speculation that the Titan may relocate. Instead, this group laid the financial groundwork in 2013 for the Titan to be stable, ensuring that management could begin building a squad that would be highly competitive within the QMJHL and beyond. The Titan has known change over its 49-year history. Starting as the Rosemont National in 1969, the team would become the Laval National in 1971, the Laval Voisins in 1979, the Laval Titan in 1985, the Laval Titan Collège Français in 1984, and finally moving to Bathurst, New Brunswick from Laval, Quebec in 1998 where they became the Acadie–Bathurst Titan. For the last twenty years while calling New Brunswick home, the Titan have only been the QMJHL champions once, advancing to the Memorial Cup tournament just once, and winning a grand total of zero games at that tournament way back in 1999. They went 0-3 at their only appearance in the Mastercard Memorial Cup to date as the Acadie-Bathurst Titan, so there was hope that this tournament would be different. They needed overtime, but the Titan picked up their first win at any Memorial Cup tournament with a 4-3 overtime victory over the WHL's Swift Current Broncos on Saturday, May 19. They followed that win with another victory over a WHL team in the host Regina Pats by an 8-6 score on Sunday, May 20. They would drop their May 22 game against the OHL's Hamilton Bulldogs by a 3-2 score, setting the stage for a three-way tie-breaking siutation as all of Hamilton, Regina, and Acadia-Bathurst finished with 2-1-0 records. Thankfully for the Titan, they finished with the best goal differential among the three tied teams, so they advanced directly to the Memorial Cup final, ensuring that the Titan would play for Canadian major junior hockey's biggest prize! Who would they play? Hamilton and Regina would clash for that right, and Regina claimed a 4-2 victory on Friday to set up tonight's Memorial Cup final between the host Regina Pats and the QMJHL champion Acadia-Bathurst Titan. Remember how I stated above how ownership and management needed to be on the same page when it comes to leveling the playing field with the teams in the larger markets? 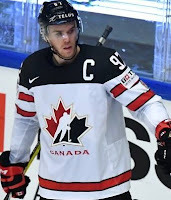 Titan GM Sylvain Couturier made incredible deals through the season, acquiring players such as scoring dynamo Samuel Asselin, goaltender Evan Fitzpatrick, sniper Mitchell Balmas, offensively-minded defenceman Olivier Galipeau, and Philadelphia Flyers first-rounder and blue-chipper German Rubtsov. These players were added to Titan players such as Noah Dobson, captain Jeffrey Truchon-Viel, and Ethan Crossman, and the Titan went bananas following the trade deadline with all their new arrivals. The Titan posted a ridiculous 23-4-2 record for the remainder of the regular season and followed that up with a 16-4 record in the playoffs. Needless to say, the Titan stormed through the QMJHL playoffs in eliminating Chicoutimi in six games, sweeping both Sherbrooke and Victoriaville out of the playoffs, and winning the QMJHL's President's Cup in six games over Blainville-Boisbriand. They didn't lose a game between March 28 and May 4 in the QMJHL playoffs - a rather remarkable achievement! In the Memorial Cup final, Adam Holwell scored in the first period to put the Titan up through 20 minutes in a period in which they dominated from start to finish. The Titan continued the barrage in the second period, suffocating the Pats in every zone while carrying the play entirely through the frame. And in the third period, the captain showed off why he's one of the best in the nation when Jeffrey Truchon-Viel set up the second Titan goal. Viel went through the legs at full speed to get past Montreal Canadiens prospect Cale Fleury before feeding the puck to Samuel Asselin out front where it found the back of the net past Max Paddock to make it 2-0. That kind of move in a game of this magnitude with a one-goal lead takes some serious moxie, but the Titan were showing the moxie all night so kudos to Viel who will be on highlight reels for the next week with that move! Ethan Crossman added an empty-netter with 30.3 seconds remaining, and the celebration was on as the Titan captured the 2018 Mastercard Memorial Cup with their 3-0 win over the Regina Pats! For the city of just under 12,000 people, Bathurst is the smallest city to win the Memorial Cup since Flin Flon, Manitoba captured the Memorial Cup in 1957! Take nothing away from Regina, Hamilton, or Swift Current as they battled hard, but the Titan looked like the best team in the tournament from the moment the puck dropped on Friday, May 18. The Titan are the first QMJHL team to win the Memorial Cup since the Halifax Mooseheads in 2013, and the eighth different QMJHL team to win the Memorial Cup since 1983 when the tournament format changed to the three CHL conference champions and the host team. Congratulations to the Acadia-Bathurst Titan, your 2018 Memorial Cup Champions! There's a general belief in hockey that coaching leads to better defensive systems before offensive systems evolve to counteract the effects of these better defensive systems. As defensive systems evolve, there is usually a drop in scoring before the offensive systems catch up to where the defensive systems are. Occasionally, however, the NHL will push through a rule that changes the environment, and the introduction of one rule changed the NHL in a remarkable way in 1929. From 1926 until 1929, NHL goaltenders were nearly unbeatable with fifteen goalies posting eleven shutouts or more in the 44-game NHL season. To give you a comparison, the last time an NHL goaltender hit eleven shutouts in a modern season was in 2010-11 when Henrik Lundqvist completed the trick in an 82-game season. Needless to say, something had to change if the NHL wanted to increase scoring and lose its growing reputation of being closer to soccer than high-scoring hockey. The NHL made the change in 1927 to allow forward passing. Prior to the 1927-28 season, passes could only go laterally or behind a player, making any sort of offensive push virtually impossible and allowing NHL defences a chance to stand stoutly at their blue lines to deny the oncoming attackers. But starting in 1927, the NHL allowed players to make forward passes in the defensive and neutral zones to help create some additional offensive chances. The only problem? It didn't work. In 1928-29, George Hainsworth pitched an NHL single-season record of 22 shutouts in one 44-game season - one every second game on average - and scoring still remained low across the board. Teams averaged just 64 goals in the 1928-29 season, and the rather-awful Chicago Black Hawks scored a league-low 33 goals out of the ten teams. The NHL saw 120 shutouts in the 220 games played in the NHL that season, so clearly this forward passing in two of the three zones didn't do what was intended when it came to finding scoring. The NHL decided in the off-season to implement and allow the forward pass in all three zones, but players were not allowed to precede the play when entering the opposition's defensive zone. Basically, the NHL wrote its own offside rule to prevent players from camping out in the offensive zone. The only question was would this change to the rule to allow forward passes in the offensive zone accomplish what the league wanted in getting more scoring? The 1929-30 season saw an explosion of goal scoring the likes of which the league had never experienced before! For the first time in the NHL's history, all ten teams broke the 100-goal mark on the season with the Boston Bruins hitting a high of 179 while the Pittsburgh Pirates squeaked across the line with a league-low 102 goals. Nevertheless, goals came far more frequently as NHL teams averaged 2.92 goals-per-game in the previous season compared to an incredible 5.81 goals-per-game in 1929-30! Boston was the far-and-away best team in the NHL in 1929-30 as they compiled a 38-5-1 record, setting new records for wins in a season, winning percentage, and most consecutive wins on home ice with 20. Ralph "Cooney" Weiland smashed the scoring records in the NHL when he potted 43 goals and 73 points - a huge leap from the previous season's best scoring marks set by Toronto's Ace Bailey with 22 goals and 32 points. Bailey's total, while respectable, would have seen him finish 22nd in scoring in 1929-30. Just as an additional bonus statistic, Toronto's Lorne Chabot led the league in shutouts in 1929-30 with six. No other netminder had more than four blank sheets. It's hard to believe that it took the NHL 13 seasons to implement the forward pass, and it might be the one rule that altered the game like no other. Yes, the NHL allowed goaltenders to drop to their knees and reduced the number of skaters from seven to six in previous seasons, but the forward pass is so vitally crucial to how the game is played that it remains the most significant rule change in NHL history in this writer's view. After all, we may never have seen the scoring exploits of Richard, Howe, Gretzky, Lemieux, Crosby, Ovechkin, or McDavid without the puck being passed forward. It's hard to imagine what the game would look like without that rule! The team pictured to the left is the Montreal Wanderers. The Wanderers had been a very successful amateur team in terms of their success prior to joining the NHL, but they officially hold one record in the NHL that has yet to be broken: shortest existence. December 3, 1903 was their official founding, but the Wanderers would only last 16 days in the NHL after a series of mishaps caused their demise. Today, we look at these 16 days as we await the start of the Stanley Cup Final on Monday. The four-time Stanley Cup champions in the NHA were one of the founding teams of the NHL in 1917 along with the Montreal Canadiens, the Ottawa Senators, and the Toronto Hockey Club. As some may be quick to point out, the Toronto team was originally called the Arenas, but the NHL didn't recognize them as such in the first season due to a "temporary arrangement" in which the league owned the team, but the Arena Gardens managed the Toronto franchise. As such, the four-team circuit which was created out of infighting with Toronto NHA franchise owner Eddie Livingstone. The Quebec Bulldogs had been invited to join the league in its initial stages, but the Bulldogs were unable to ice a team in 1917-18, prompting the league to found the Toronto Hockey Club as stated above. With the Bulldogs unable to ice a team, the players from the Bulldogs were entered into a dispersal draft where the Wanderers selected four players, most notably Odie and Sprague Cleghorn, but opted not to pick Joe Malone who went to the Canadiens. With the dispersal draft out of the way, the first season of play in the NHL was set and ready to begin! And this is when things for the Wanderers took a serious turn for the worst. First, Sprague Cleghorn was lost for the season with a leg injury after falling on an icy sidewalk. Following that, Odie Cleghorn was removed from the roster to fulfill a condition that exempted him from serving in the military only if he didn't play hockey. Needless to say, losing the two biggest acquisitions made by the Wanderers before the season even began was a blow that most teams in that day and age would be one from most they would not recover. The Wanderers were no different. On December 19, 1917 at Westmount Arena on Rue St. Catherine, the Wanderers hosted the Toronto Hockey Club in the opening game for the NHL. In what was a spirited event, the Wanderers won the game 10-9 over Toronto with Wanderers defenceman Dave Ritchie scoring the NHL's first goal early in the game! Harry Hyland had four goals for the Wanderers, recording the league's first official hat trick, and while the legendary Art Ross picked up the league's first penalty as a member of the Wanderers! However, it was estimated that only 700 fans attended the game as Montreal's French-speaking population had thrown their support behind the Montreal Canadiens. This attendance figure was bewildering to owner Sam Lichtenhein considering he had granted free admission to military personnel and family for the game. Nevertheless, the Wanderers continued to try to appeal to Montreal's English-speaking population as they looked for support. Westmount Arena, shared by the Wanderers and Canadiens, was fairly unique in that it was one of the first arenas ever built specifically for hockey. It featured four-foot high boards around the perimeter of the rink with rounded corners - unheard of at the time it was built in 1898 - and it featured seating for 10,000 fans - another rarity for a single-use arena setup - with 4300 seated and 5700 standing. In 1915, the first artificial ice-making plant in Montreal was installed at Westmount Arena. This was seen as revolutionary in terms of maintaining ice, but this is the Wanderers' season so this won't be the last time we speak of it. Two days after the win, the Wanderers hosted the Montreal Canadiens, and this was the worst defeat in NHL history to that point - all two games of the league's existence - as the Canadiens trounced the Wanderers 11-2. Five days later on December 26, the Ottawa Senators came to Montreal for a Boxing Day match and they skated to a 6-3 victory over the Wanderers. Through one week and three home games, the Montreal Wanderers were 1-2-0 with 15 goals-for and 26 goals-against. The team went out on the road for the final game in December. On the 29th, they met the Senators in Ottawa, and things didn't get any better in a 9-2 loss as they closed out 1917 with a 1-3-0 record to sit in fourth-place, trailing the 3-1-0 Canadiens, the 2-2-0 Toronto Hockey Club, and the 2-2-0 Ottawa Senators. 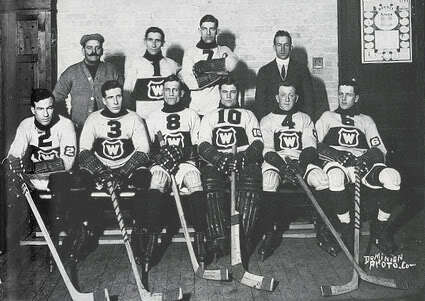 There was hope that the Wanderers would turn their three-game slide around with their January 2, 1918 game against the Montreal Canadiens approaching, but neither team would take the ice on that night as a fire that started in the ice-making plant in the afternoon quickly spread to the dressing room areas of the Westmount Arena before roaring throughout the arena. Despite fire crews making it to the scene fairly quickly, the arena's roof collapsed in the fire and all that remained when the fire was finally extinguished was rubble. With attendance not breaking 1000 fans in any game, losses mounting, carrying debt from previous seasons, and an insurance policy that only covered one-third of the $150,000 in losses suffered by the team including all the equipment and sweaters for the Wanderers, owner Sam Lichtenhein met with NHL President Frank Calder on January 4 and informed the league that he was ceasing operations of the Wanderers. 16 days into the NHL season, and the league had lost one of its founding member franchises. Officially, the game against the Canadiens, in which the Wanderers were the visitors, was listed as a forfeit in favour of the Caandiens. The January 5 game in which the Toronto Hockey Club was scheduled to host the Wanderers was also ruled as a forfeit in favour of Toronto. As a result of Lichtenhein's announcement, the league drew up a new schedule for the three remaining teams with the first game scheduled for January 9. The Wanderers would not be revived, but Lichtenhein retained his voting rights in the NHL executive roe the remainder of the season as Toronto was without owners with the NHL owning its rights. Three owners meant anything that went to a vote could be resolved quickly, so it was important for him to remain as part of the league until the conclusion of the season. Lichtenhein's vote would be replaced the following season when the Toronto Arenas officially began play under ownership of the Arena Company where the GM of the Toronto Arenas, Charles Querrie, voted as his team's representative. Officially, the Wanderers existed as an NHL team from December 19, 2017 until January 4, 2018 - some 16 days after having been one of the most successful amateur teams in Canadian hockey history. While their existence is a mere blink of an eye in a century of NHL history, they do have several important records held. That will always belong to them and their 16 days of being an NHL team! The Hockey Show, Canada's only campus-produced radio show that strictly talks hockey, has a big show with some extremely important guests have done some hockey-related things! As vague as that is, we're going to close out Round Two of the Survivor: NHL Playoffs contest, sponsored by Lays and their Show Your Emotions contest, by eliminating Jeff and the San Jose Sharks before hitting the breaks on any additional exit interviews this week. Why, you ask? We get to welcome three amazing individuals who will allow Beans and I to talk about all sorts of achievements and accolades they've managed to acquire in their hockey careers! 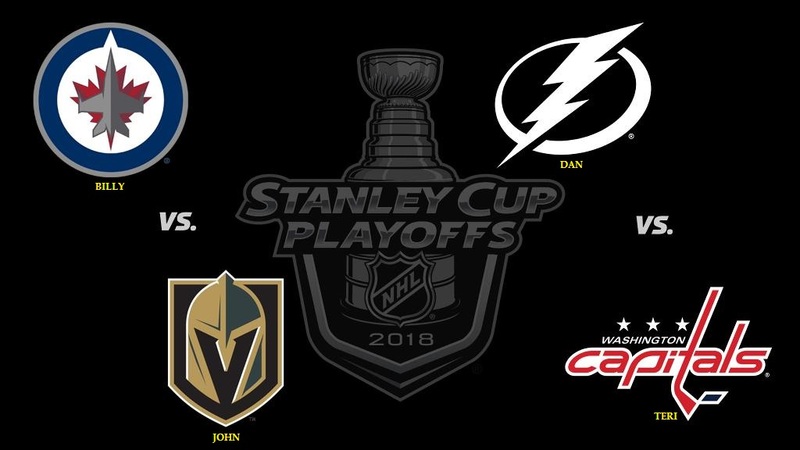 Before we get to that, let's update the Survivor: NHL Playoffs contest after last night's Game Seven between the Washington Capitals and Tampa Bay Lightning. Our two long-distance out-of-town entrants are the final two Survivors standing on NHL Playoffs Island as John, carried by Marc-Andre Fleury and the Vegas Golden Knights, will square off against Teri, powered by Holtby and Burakovksy in Game Seven's win over Tampa Bay. Only one can survive, and the Stanley Cup Final starts on Monday, May 28! With their eliminations, we'll have Billy and the Jets do an interview next week along with Dan and the Lightning to close out Round Three! Tonight, however, we have more pressing matters as the three women seen to the left will be in-studio - Twizzlers for all! - to talk some hockey! The Hockey Show is proud, humbled, privileged, and honoured to welcome three members of the Balmoral Hall Blazers to the studio in Regan Boulton, Katie Bassett, and Kennesha Miswaggon! Katie and Kennesha play for the Blazers while Regan, an alumna of the program, works for the Blazers as the Admissions Officer and Hockey Recruiter for the school. These three won a bronze medal with the Blazers at this year's Female World Sport Challenge in early February before Bassett and Miswaggon went on to represent Manitoba at the National Aboriginal Hockey Championship where they captured Manitoba's second consecutive gold medal at the event! We'll talk to them about school life and traveling in a prep hockey program, winning medals, being generally awesome, and everything else before we quiz them on how much they actually know about Regan Boulton because her hockey career is one that may amaze you. Tune in tonight when these three amazing women join Beans and I on The Hockey Show at 5:30pm! Tonight, we meet Regan Boulton, Katie Bassett, and Kennesha Miswaggon to hear all about their amazing hockey careers and much more only on The Hockey Show found exclusively on 101.5 UMFM, on the UMFM app, on the UMFM.com web stream! More Musicians? You Got It! It's a Wednesday, there's a pretty important Game Seven being played in the NHL between the Washington Capitals and the Tampa Bay Lightning, there's an AHL Calder Cup semifinal game happening that features the Toronto Marlies and the Lehigh Valley Phantoms, the Fort Wayne Komets and Colorado Eagles are battling in the ECHL's Kelly Cup Playoffs, and there were a pile of awards handed out in the KHL today plus they tossed out some news. All of that happened, but I'm back with another pile of images of musicians with hockey merchandise. Why? Because I found a trove of images that I feel I need to share. So let's do that now! I had made the comment in the last article that Canadian twins Tegan and Sara hadn't been spotted in a hockey jersey despite being Canadian and despite Sara holding a Team Canada jersey. 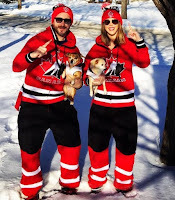 Well, I was wrong because the Calgary-based twin songstresses actually have Calgary Flames jerseys! Tara Slone is back with another somewhat-obscure jersey as she visited Sarnia and donned the jersey of the Greater Ontario Junior Hockey League's Sarnia Legionnaires! The Legionnaires have been around since 1969, but only have used the name "Legionnaires" since 2008. From 1969-1995, they were the Sarnia Bees. From 1995-1999, they were the Sarnia Steeplejacks - a tradesman who scales large buildings, chimneys, and church steeples to make repairs and performance maintenance. From 1999-2001, they combined the names to become the Sarnia Steeplejack-Bees - seriously? - before becoming the Sarnia Blast from 2001-2008. The history of this team's names is something to behold! Speaking of obscure, I'm going to doubt that anyone in North America has heard of Pelegeya, better known by her full name of Pelageya Sergeyevna Khanova, who sings "folk-songs from different nations in different languages, romances and compositions written by the members of her group, mostly in rock arrangements" as per Wikipedia. Apparently, she and Russian hockey player Ivan Telegin have been in a relationship for some time, and she was spotted wearing the Team Russia colours - that's her on the left - while supporting her husband! Nickelback is from Alberta. Nickelback plays concerts in large cities. Nickelback got Calgary Flames jerseys! In a photo that is from last year, I would have never guessed that actor Jared Leto and lead singer of Thirty Seconds to Mars would don anything hockey-related. However, I was wrong as Jared Leto donned a Nashville Predators t-shirt from the Stanley Cup Final at some point! Gerald Earl Gillum, better known to rap and hip-hop fans as G-Eazy, was born in Oakland, California. Like most rappers and hip-hop artists, there seems to be some affinity for hockey jerseys as G-Eazy has sported a Wisconsin Badgers jersey and a Chicago Blackhawks jersey in separate concerts! Clay Aiken at the 2011 NHL All-Star Game. 'Nuff said. Someone I'd never expect to see in an NHL jersey during a hockey game: Charlie Daniels of the Charlie Daniels Band! The devil may have gone down to Georgia, but the musician visited Nashville and got himself a jersey! I wasn't aware that he was a big hockey fan, but drummer Chad Smith of the Red Hot Chili Peppers is apparently a big New York Rangers fan! He actually plays goaltender in charity events! For a number of Canadian artists who found themselves working in Las Vegas over the last few years, having the Jets meet the Golden Knights in this year's playoffs tested some musicians' loyalties. Bartley Kives found this out when he spoke to Brent Fitz, seen on the right, who is from Winnipeg but lives and works in Las Vegas. Fitz, for those who want some background, has worked with and/or played with Slash, Theory of a Deadman, Alice Cooper, Vince Neil, Gene Simmons, The Guess Who, Streetheart, Harlequin, and Econoline Crush. Country musicians are frequent on these articles, so let's credit Brandon Lay with somewhat breaking tradition as he, standing on the left, donned a Chicago Blackhawks jersey while in the Windy City! Vegas' musical fanbase is growing with each and every playoff win, and one of the groups who are now full-fledged Golden Knights fans are the Backstreet Boys. I always like seeing musicians supporting their hometown teams. That's as close to being a true fan as one can get. Credit Ottawa-based country musician Angela Marie for supporting her Ottawa Senators in one of those rather hideous alternate jerseys. If you had to pick one musician who is synonymous with Las Vegas, a resounding number of people would automatically name Wayne Newton as their choice. He has been called "Mr. Las Vegas", and has been performing in Vegas since 1958! It's only appropriate that Wayne Newton is officially in the Vegas Golden Knights fan club! Vince Gill had the honour of being one of the celebrity coaches when the NHL All-Star Game visited Nashville! Ron Burwash is a name that won't be familiar to many, but he actually played hockey before becoming a prominent musician who sang of Métis traditons and customs! There's an excellent article I hope you'll read that was written by Eric Westhaver in the Flin Flon Reminder about Ron Burwash. Why is that important? Here's a photo of Tom Gilmore, Bobby Clarke, and Ron Burwash with the Flin Flon Bombers! It's kind of cool to see two musicians who share a love of hockey performing together, but I'm not quite certain how the arguments in this "superband" are settled with Jody Richardson sporting the colours of the Detroit Red Wings and Kim Stockwood wearing the Boston Bruins jersey! If you can see him in the background, that's Dave Bidini on guitar as well, and he's a huge Maple Leafs fan! They have half of the Original Six teams covered in this collection of Canadian music icons who came together to write a hockey song about a real-life hockey romance! Kelsea Ballerini is a country music singer, and she was a featured performer at the NHL All-Star Game in Nashville! Earl Pereira, formerly the bassist for Wide Mouth Mason and currently performing with The Steadies, donned the pads and an Oilers jersey to show his support of his favorite team! That baseball glove, while good for stopping road hockey balls, won't do anything if he's stopping pucks. I'm not familiar with his solo music, but Canadian songwriter and country and rock musician Dallas Smith was once the lead singer for the band Default. He was born in Langley, BC so you'd think he'd be a little more of a Vancouver Canucks fan, but here he is sporting an Ottawa Senators jersey! Yes, this is a terrible image, but I had to grab it off a screengrab from a cell phone video posted to social media, so it was already going to be bad. However, Shania Twain rolled through Winnipeg recently. Did she add a Jets jersey to her wardrobe? Somehow, she did not. The man pictured, though, is her guitarist Cory Churko, and he made the Winnipeg fans happy! Let's do the Justin Bieber hockey jersey world tour as he was seen wearing the jerseys of the minor-hockey Stratford Warriors, the Toronto Arenas, the New Jersey Devils, the Manchester Storm, les Gothiques d'Amiens, Team Canada (how is he always with Gretzky? ), the Army Black Knights, the Toronto St. Pats, and the home jersey of the Arizona Coyotes. I'm almost certain he has an entire walk-in closet just filled with hockey jerseys at this point. If we can have an androgynous musician's world hockey jersey tour, we can certainly have one for a man who has what most would be considered a female name. Alice Cooper is a big hockey fan, and we can stamp that official with Alice appearing in a retro Coyotes jersey, an Edmonton Oilers jersey, a Detroit Red Wings jersey, a Nashville Predators jersey, a Manchester Storm jersey, a Phildelphia Flyers jersey, and a Reading Royals jersey! Alice Cooper moves up the "who has the most jerseys standings" in a big way on this article! With the two articles just a week apart featuring all these musicians, I feel like I'm making up for lost time as I hadn't posted anything in the musicians-in-jerseys category in a long time. If you want to see the full collection of all the musicians who have been found wearing some sort of hockey jersey or something close to a jersey, please click here. If you have an image you want to submit, send it here! Credit will be given, but make sure you check the list first! It's another Tuesday, so I'll be back in the heat and sunshine of the ball diamond umpiring once more. Like last week's Tuesday entry, there's another logo to examine as the ECHL welcomed its newest member club in the Newfoundland Growlers! The Growlers, rumoured to be the Toronto Maple Leafs' ECHL affiliate in the coming season, rolled out their logo - seen to the left - as they unveiled the name, logo, and website today for the team. And whenever there's a new logo unveiled, HBIC is there to opine on the new imagery that has been released! The key to remember in all this? My opinion amounts for squat, so if you're happy with what you read here, I will issue full refunds for anyone who wants them! Let's go to the marketing speak first. That's a solid description of a Newfoundland dog, but there's already a problem as Newfoundland dogs were naturally found as black or Landseer (black-and-white), not brown or gold as pictured in the logo. The traits describing the dog - strength, intelligence, loyalty - are all trademarks of the breed, though, so kudos to the Growlers for picking a majestic animal to represent their team. Even if the colour of the dog is a product of domestication. The logo was designed by Idea Factory, a St. John's marketing company, who has worked with companies like Harley-Davidson Motorcycles, Suncor Energy, The Salvation Army, Marine Atlantic, and The Paint Shop among the numerous regional, national, and international companies on their portfolio. In other words, these guys know what they're doing, and I personally like the logo that Idea Factory came up with for the Growlers! "The colour palette was inspired by an iconic photo of Private Hazen Frazier with Sable Chief, a Newfoundland dog that served as the mascot of The Royal Newfoundland Regiment during WWI. The vintage tones compliment the dog's dark hues, creating a strong combination with a classic, universal appeal. Paired with a forged-style font, the hard edges and strong weight give it a stone-chiseled feel which lends itself well to the vintage style of the logo." I like the logo a lot, and the colours chosen by the team could given the Growlers one of the more unique looks in all of hockey. Here's the video the team used today at the press conference. Ok, count me in as one of the excited fans of the Growlers! I'm excited to see the uniforms they'll wear, and those will be unveiled later this summer as the first game for the Newfoundland Growlers in their inaugural season will be October 12 when they face off against the Florida Everblades at Mile One Centre. 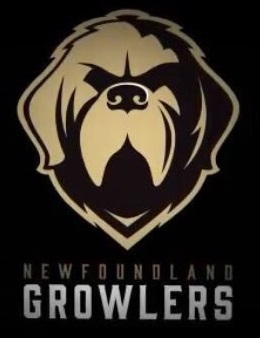 In saying all this, the question must be asked: what are your thoughts on the ECHL's Newfoundland Growlers? I was going to write this funny opening bit about Lou Lamoriello calling New York Islanders general manager Garth Snow and basically telling Garth that he was on his way to help save the Islanders by ensuring that John Tavares stayed on Long Island in Brooklyn. It occurred to me as I was writing said bit that perhaps Garth Snow might have actually asked assistant GM and Lou's son Chris Lamoriello for some help in what will surely be a defining negotiation for the Islanders franchise and Garth Snow's legacy. If Tavares leaves via free agency, the Islanders are doomed. If they re-sign him long-term, there's a chance they can really build something with some of the great prospects they have in their system. Lou Lamoriello joining the Islanders certainly is news, but this might be a story of how Garth Snow signed his own termination papers. It's unknown exactly what role Lou Lamoriello will be assuming in the Islanders' hierarchy at this point, but you'd have to figure that he brings with his a sense of stability for a franchise who simply seems stuck in neutral outside the playoff picture. At this point, I'd expect him to move into a corner office with a title of Savior of Franchise or something grandiose that basically tells everyone - Garth Snow and son Chris included - that he's making the decisions about everything hockey happening at Barclays Center now. Otherwise, why would he make this move? As an advisor for the Leafs, he could impart wisdom on new general manager Kyle Dubas, but Dubas doesn't have to listen. That's not something that I believe a man who pulled every string with the New Jersey Devils and the vast majority of strings with the Maple Leafs could be happy with, so this move almost became inevitable the moment that Brendan Shanahan removed the "General Manager" placard off Lou's door at the Air Canada Centre. Lou Lamoriello likes being in charge and certainly holding the power of control when it comes to the hockey teams he has worked for, and this move to the Islanders sounds like he's already making waves. According to reports, Lamoriello has already reached out to John Tavares in an effort to keep him in the Islanders' fold, and that's probably something that Tavares never expected unless the call was coming from downtown Toronto. Where Lou excels in his manipulation of information is that nothing is ever leaked to, told to, implied by, or said explicitly to any member of the media without Lou's authorization. In other words, Lou Lamoriello could have been working for the Islanders for the last two weeks, and no one would have been the wiser. As it stands, his contact with Tavares apparently is kosher with the NHL thanks to his behind-the-scenes work on behalf of the Islanders that started, well, whenever he arrived in Brooklyn. 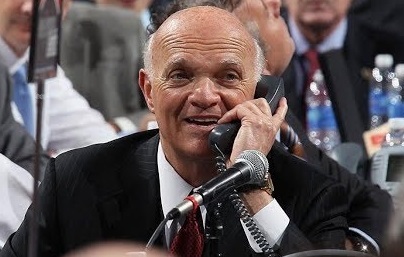 On Lamoriello/NYI/Tavares contact, I’m told that in the eyes of the NHL, there are no issues with the process. So what happens now? Lou Lamoriello will most certainly find a way to keep John Tavares. That is the first priority for the Islanders if they have any hope of being relevant in the next decade. After that, expect Lou to institute an impressive scouting department and draft strategy that will put the Islanders in a good position within three-to-five years. From there, it's all about signing quality college-graduated free agents that will fill gaps and provide excellent depth to an organization desperately needing some. Like he did in Toronto, this won't be an overnight change. Lamoriello will change the culture entirely from within the organization in order to being stability and, more importantly, success to the franchise from the product on the ice at Barclays Center to the AHL's Bridgeport Sound Tigers to the ECHL's Worcester Railers. There may be steps backwards in order to move forward, and this might be a confusing time for Islanders fans who have long wanted to see a winning team on the ice. If you trust in Lou, though, he will change things for a franchise that desperately needs some success in both the regular season and the postseason. The one person who may not get to experience this? GM Garth Snow. Snow has been guiding this Islanders ship since July 18, 2006 when he took over after Neil Smith was dismissed after just 41 days. Snow has brought in some impressive talent during his time in the big chair - Ryan Smyth, Jordan Eberle, Shane Prince, Nick Leddy, Johnny Boychuk - but the Islanders have missed the playoffs seven times in his 12 years at the helm and have only advanced past the first round once. That's not the kind of resumé you want to roll out in front of your new boss, and Lou Lamoriello, known for making coaching changes at rather odd times, may dismiss his general manager in the near future in order to change the culture. A new era in New York Islanders hockey has begun, and the winds of change may already be blowing as Lou settles in to right another ship. If he can make the Islanders as successful as the New Jersey Devils, there might be a very good reason to start calling them the Lou York Islanders. The outlook wasn't brilliant for the Winnipeg Jets today: the score stood two to one, with but one period more to play. Everything the Jets threw at Marc-Andre Fleury, save for one Josh Morrissey shot, had been turned away. And, in Vegas, fans are cheering, and, in Winnipeg, fans will pout, because there is no joy for the WhiteOut — the mighty Jets are now out. 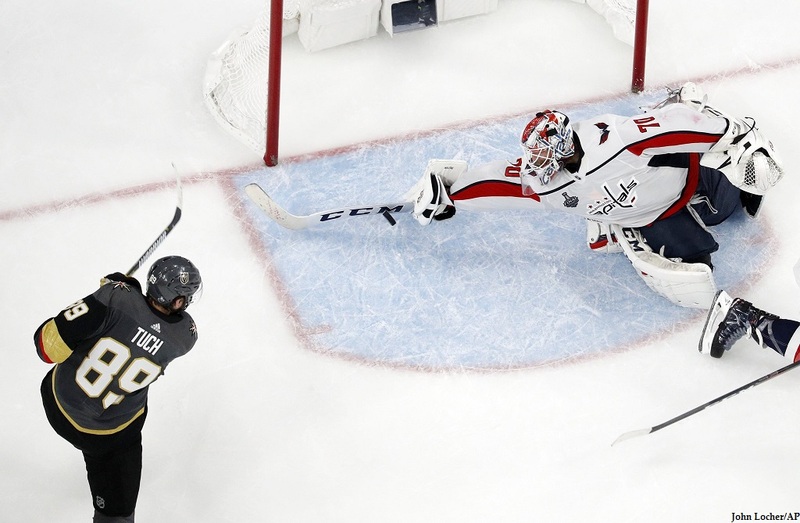 In a 4-1 series win, the hottest goaltender in these playoffs in Fleury took his team to new heights once more as Vegas joined the Toronto Arenas and the St. Louis Blues as the only expansion teams to reach the Stanley Cup Final in their first seasons. Jonathan Marchessault, a 27 year-old winger who had been cast aside by Columbus, Tampa Bay, and Florida, was outstanding in this series win over the Jets, and linemate Reilly Smith, who was part of the Tyler Seguin-to-Dallas deal and was sent to Florida for Jimmy Hayes, had himself one heckuva series as well. In the end, those three players were the darkness that swallowed the WhiteOut's enthusiasm as they continually deflated the sails of the Jets who, at times, seemed like the better team for large chunks of games. It didn't matter if the Jets scored, though, as one of Marchessault or Smith would respond moments later with a goal, a turnover to cause a goal, or a pass to setup a goal. On the other end, Fleury continued to come up big for Vegas as he turned away Jets chances time and time again. Make no mistake that this Vegas Golden Knights team is a collective bundle of energy who bring intense pressure on the forecheck, forces turnovers in the neutral zone, and plays in-your-face in the defensive zone with little regard for their own bodies and safety when it comes to blocking shots and throwing hits. They're fast, aggressive, and they roll four lines as well as anyone as the Jets found out. Having a three-time Stanley Cup champion between the pipes behind this group of players with a singular focus only makes them that much harder to defeat. The series-winning goal came off the stick of one-time Manitoba Moose defender Luca Sbisa - a defender who was roundly considered one of the worst defenders fans had seen in his time with the Moose - and was deflected past Connor Hellebuyck by Winnipeg-born Ryan Reaves - a physical specimen traded for by the Penguins to defend their stars only to be traded to Vegas when a salary cap crunch was presented upon the Penguins' acquisition of Derrick Brassard. 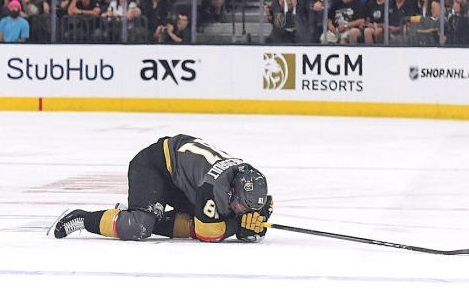 The Winnipeg connection on the series-winning goal was not lost on me, and I want to give credit to Vegas head coach Gerard Gallant who found the positives in the games of two players who were thought to be nothing more than bottom-of-the-lineup players. Look, it wasn't all Vegas in this series either. Connor Hellebuyck lost the battle between the two goaltenders, but I'm pretty sure that Jonathan Quick and Martin Jones - two goalies who had outstanding seasons and playoff series - lost that battle too. Hellebuyck was good enough to win at least two of the games that Winnipeg lost, but the problem was that Marc-Andre Fleury was just that much better in keeping the Jets from providing their netminder the goals he needed. The duo of Mark Scheifele and Blake Wheeler was outstanding for the entire playoffs, and they needed just a little more from rookie Kyle Connor to take their play to the next level. Connor was great at times, but not consistently great throughout the playoffs. The maturity, experience, and knowledge Connor gained throughout these playoffs will benefit him for the remainder of his career. Paul Stastny, as has been said on many sites, was the absolute gem of the trade deadline as he made the Laine-Ehlers combo that much better. 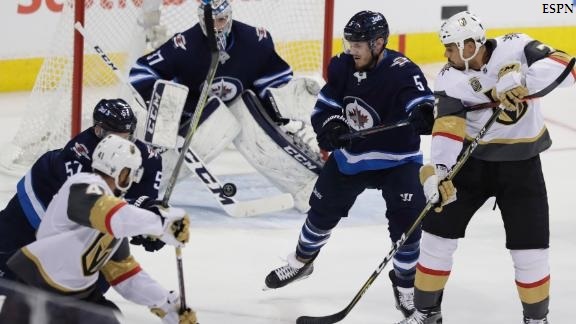 His 13 points came at vital times, but, like the rest of the Jets, he found himself against a very stout Golden Knights defence that wouldn't allow him to set up shop in front of Fleury as easily as he had in previous series. Stastny should be in-line for a solid pay day as his performance in these playoffs was the most inspired I had seen him play in several seasons. While people lamented on the lack of goal-scoring between Patrik Laine and Nikolaj Ehlers - five goals combined, all off the stick of Laine - these are two young players experiencing their first NHL playoffs. Defences tighten up, room to maneuver is less, and there aren't a lot of openings one can take without being hit or defended. They'll learn how to score goals in these spots, but their 14 combined assists show that they're weren't AWOL in the Jets' lineup. They made good plays and found players who were in prime scoring spots, and that's a huge positive for these two young players. Trouba, Morrissey, Byfuglien, Tanev, Copp, Lowry, and Perreault all showed their worth in the Jets' lineup as well while players like Joe Morrow, Ben Chiarot, and Jack Roslovic should all be given shots at cracking the roster full-time next season. This Jets team is deep and talented, and that bodes well for the future. If there's a silver lining on today's dark cloud over Winnipeg, there should be some review of history. The Chicago Blackhawks, whose model which upon these Jets were built, lost in five games to Detroit in 2009 before starting their three-Cups-in-six-years run in 2010. There is absolutely zero guarantee that Winnipeg will do the same thing, but the youth and experience that this Jets team possesses would make it seem like they're an automatic favorite for next season already. It was one heckuva run for a team that most figured would just make the playoffs this season, let alone be second-overall in the NHL and a Western Conference finalist. Take nothing away from what the Jets accomplished - they played their tails off and deserve a pile of credit for the efforts given and results attained. The success of this team made the WhiteOut and the street parties a ton of fun, and there's real hope and confidence this will be an annual event now. In the end, a well-coached team with an incredible system and an amazing goaltender ended the season for the Jets. There's a line in hockey that one must first learn how to lose before one learns how to win. The Jets will learn from this series loss, and they'll hopefully be able to take steps forward from it. If they do, next season could prove even bigger for the fans in Winnipeg! For now, the summer is for making improvements, adjustments, and fixes that the Jets need to take that next step. There will be difficult decisions to make, but that's why GM Kevin Cheveldayoff makes the big bucks. It all starts again in October, Jets fans. Today marks the end of the beginning of the era of the Winnipeg Jets. Reset this summer, and let's get ready for another incredible season of Jets hockey! There are many people breaking free from social media sites for a variety of reasons. Facebook has its many problems that have recently been exposed. Twitter can often be a rather bleak place due to a number of factors. And, for a number of people, all social media just eats up time that people are now using towards other things. The last reason is my reason for going social media-free for at least one day per week, and I have to say that it's actually pretty incredible how much I haven't missed it on days where I put my phone down and forget about it. For as being as digital as I am, going old-school has been nothing short of tech vacation that I'm finding I was missing. A few people who I've told about this plan have expressed some worry about not carrying a phone for obvious reasons. If there is an emergency, what would I do? If one of my friends or family members has an emergency, how would he or she reach me? What if there's an important phone call that I miss? All of these are valid reasons not to carry my phone, so I have made a couple of adjustments to my pledge of having a social media-free day. I will carry my phone, but I will not look at it unless a phone call is coming in or I need to make a phone call. 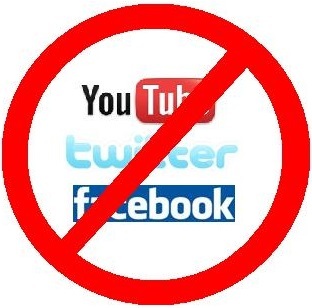 There are no exceptions to this rule - no social media, emails, texts, etc. My smartphone becomes simply a telephone on days where I step away. Instead, today was a day of work around HBIC Headquarters. I planted both my vegetable and flower gardens. I applied more sand to my interlocking sidewalk and parking area, and it looks amazing! I moved the lawn, I pulled weeds, and I barbecued on a gorgeous, sunny day. In other words, I used my day productively while ignoring the buzzing of my phone! In what might be more of a surprise, I actually feel way more happy and accomplished than when I'm a slave to my phone. I haven't made this public, but I've been doing this now for a few months. It's actually a huge relief and a sense of freedom that I've never felt before. Yes, those are first-world problems that I shouldn't be exalting, but less time on social media means more time for important things. And apparently it's not just me who feels this freedom. I realize that as a blogger and a radio host that I can't entirely walk away from social media. I use it for networking and booking interviews, so it plays a vital role in my hobbies that I simply can't abandon. I'll still use it and I'll still be active on it, but I'm finding out as I get older that the adage of "less is more" holds true to hundreds, if not thousands, of things in life - social media included. Please don't think this is a plea or cry fro help to ask you to do the same. It's not, and I'd never ask that of anyone. To each their own, and your usage and activities on them are yours and yours alone. Do what makes you happy, and if that requires any number of social media interactions, have at it. In the end, I'll be doing less social media interaction, specifically on the weekends. As I sat watching sports highlights into this evening, it occurred to me that I missed Canada lose to Switzerland, the US lose to Sweden, the Capitals lose to Tampa Bay, and a number of other sports results. It also occurred to me that I didn't miss the commentary and hyperbolic outrage and severely-dramatic reactions to any of this found on social media. For an entire Saturday, I felt free of all of that nonsense, and I pledged I'll do it again next weekend. It's always impressive to me when sports introduces new technology that could potentially change how the game is played and broadcast. Soccer has been using GPS tracking to show how fast players run, their field coverage, and, with the assistance of tracking chips, their fitness levels and heart rates during the game. It's rather amazing to see these statistics tracked and posted in real-time, and it seems that the IIHF is getting in on the technology wave as they introduced new technology at this year's IIHF World Championships in Denmark! Now the video that the IIHF posted between Latvia and Sweden offers no audio, so it's a little difficult to pick up exactly what is being tracked at any point in the video below. According to the IIHF, though, they're measuring "puck speed, player position, shots on goal," and any other relevant stat they can pull off the video. Watch below as Sweden spends a lot of time in Latvia's zone. Again, it's hard to actually see any of these stats in action when there isn't a screen showing you what is being tracked. I like that there's a potential for isolation so one can see one player's immediate statistics, but there needs to be some more elaboration to see exactly what is being tracked. Nevertheless, this new technology could potentially give coaches and management new tools that they can use to improve systems and the play of their teams on the ice. They tagged this video with "The future is coming", but it looks a lot closer than they make it sound. If soccer is doing it, hockey may not be far behind. While hockey is far more violent in terms of physical play compared to soccer, the idea of tracking players on the ice is one that people have been manually doing for a while. 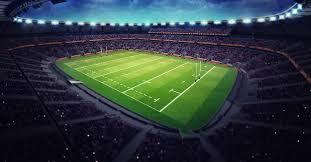 Having chips and GPS units tracking this rather than players with pens and paper will certainly move the game forward. How long does it take for the NHL to adopt this? 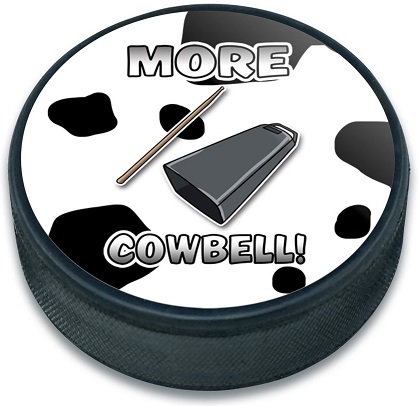 I would say it might be part of the on-ice technology within a few years if it works at the IIHF level! The Hockey Show, Canada's only campus-produced radio show that strictly talks hockey, is back with four more exit interviews from Survivor: NHL Playoffs tonight! Honestly, these should be good ones as Teebz and Beans close out Round Two with Nashville and Ryan, San Jose and Jeff, Boston and Jared, and Pittsburgh and Tom all being evicted from the island tonight! Let's get this rolling! Here are the remaining entrants in Survivor: NHL Playoffs brought to you by Lays and their Show Your Emotions contest! After we dismiss Ryan, Jeff, Jared, and Tom from Survivor: NHL Playoffs, we'll chat about McDavid and Team Canada against Russia in the World Championships, more notable player movement from across the globe, Team Manitoba women winning the National Aboriginal Hockey Championship for the second consecutive year, the loss of Clare Drake, the Steinbach Pistons at the RBC Cup, and the longest game in AHL history. If we're lucky, we might even get a special guest on the phone for an update from the RBC Cup because we have correspondents everywhere! Ok, not really, but we'll try to get an update on how the Pistons are doing from someone who is there cheering them on! It's another busy edition of The Hockey Show, so make sure you tune in at 5:30pm CT! How can I tune in, you ask? The easiest way is for you to download the UMFM app on your phone or tablet. It's literally the easiest and most convenient way to listen to any of UMFM's great shows any time of the day, so go get it! Just follow this link on your iDevice or this link for your Android device and get the UMFM app! It's never been easier to tune into The Hockey Show or UMFM! Download the UMFM app today, and don't miss any of our great programming or shows! Of course, you can do the radio thing at 101.5 on the FM dial and you can always listen online via the UMFM website! Tonight, Teebz and Beans eliminate four more contestants, chat about a number of tournaments, discuss a pile of hockey things, and much more only on The Hockey Show found exclusively on 101.5 UMFM, on the UMFM app, on the UMFM.com web stream! 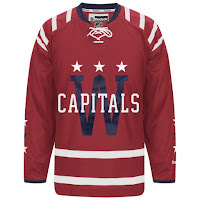 I'm still not a fan of these Washington Capitals Winter Classic jerseys, but to each their own, right? 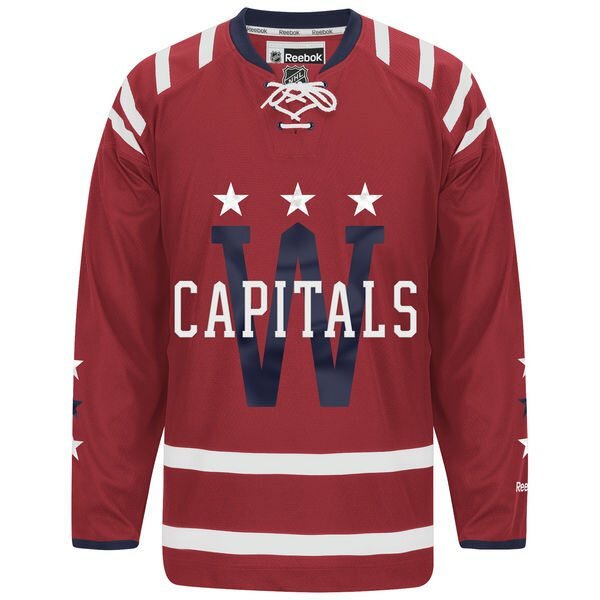 The Capitals donned these jerseys in 2015 during their Winter Classic appearance at Nationals Park against the Chicago Blackhawks. With my interest in the Winter Classic events waning, I had to hit the internet to remind me that the Capitals won 3-2 over the Blackhawks as Troy Browuer scored the game-winning goal on the power-play with 13 seconds to play. I don't remember this game standing out for any reason, but one baseball team wants to honour the event and team with their crossover promotional jersey. 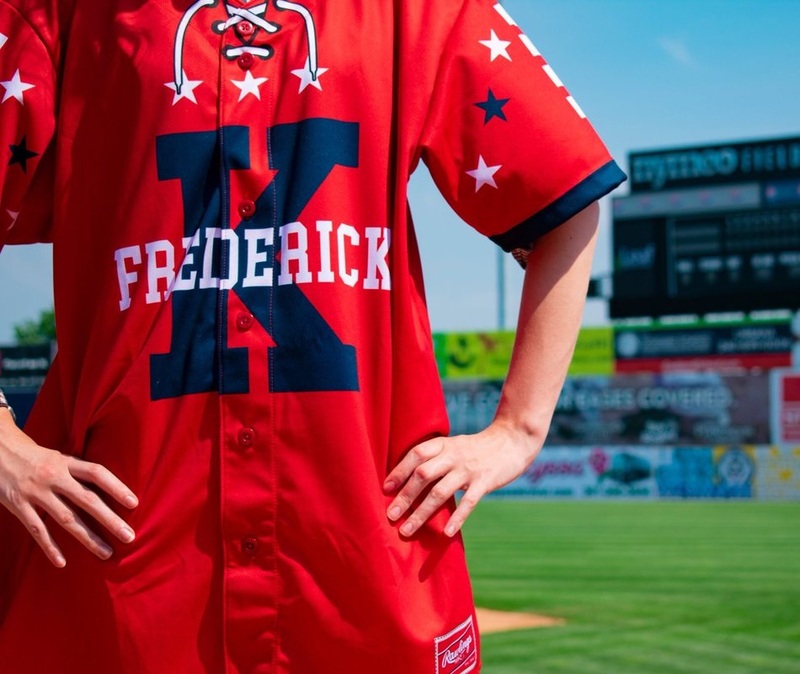 The Class-A Carolina League Frederick Keys baseball team decided to don jerseys inspired by the Washington Capitals' Winter Classic look as they play the Myrtle Beach Pelicans on Friday night. 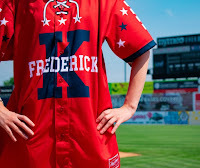 Dubbed their "Summer Classic" jerseys, the Keys are the Class-A affiliation of the Baltimore Orioles and are based in Frederick, Maryland, some 50 miles away from Washington, DC which is home to the Capitals. With the Capitals in the Eastern Conference Final against the Tampa Bay Lightning, it appears that the minor-league ball team is throwing their support behind their NHL neighbours. Normally, I'm entirely against crossover promotions between sports because it dilutes the logo and importance of one of the two teams. This one, however, might work despite the Keys using the design of the Capitals. The Keys are named for Star-Spangled Banner poet Francis Scott Key, a native of Frederick County. The Star-Spangled Banner is, of course, the US National Anthem, and the capital of the United States is Washington, DC. It all ties together, so this is one of those promotions that works on a good level for the Keys. Does it really need Washington's Winter Classic look? No, not really. The red-white-and-blue works for the promotion, but the Keys really could have used any other design. The fact that the Capitals are in the Eastern Conference Final is merely coincidental, so the Keys may not have even had this opportunity had the Capitals fell short once again. Either way, the Keys will have former Washington Capital Mike Knuble at the stadium to throw out the first pitch on Friday as they celebrate the success of the Capitals. Where this promotion deserves some kudos is in the charity department. As per the Keys, the team auction off the jerseys following the game with proceeds benefiting Play4TheCure, a charity "dedicated to raising funds for the National Foundation for Cancer Research through competitive sports featuring recreational sports clubs, middle schools, high schools and collegiate sporting events." There is absolutely zero problem with that, and kudos to the Frederick Keys for teaming up with Play4TheCure. Washington could go up 3-1 in tomorrow's game in Tampa Bay, so Friday could be a big night for the Keys. We'll see what happens in both tomorrow's Capitals-Lightning game and Friday's Keys-Pelicans game as both teams look for wins! This is just going to be a quick addition since I'm off to umpire again tonight. Above is the logo for the newest ECHL team in Portland, Maine. They are the Mariners of Maine. Yes, like the Mighty Ducks of Anaheim and the Los Angeles Angels of Anaheim, we have another "of" name. Personally, that just seems so minor-league, but that's my opinion. The ECHL affiliate of the New York Rangers will begin play this fall, so it's time to ask the obvious question regarding any new team: do you like the name and logo? My take? The logo is fine. The name is awful. 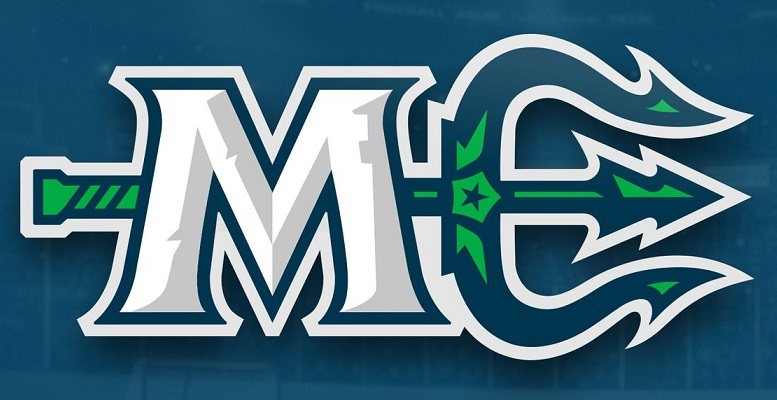 Maine Mariners? Ok, no real problem despite it being Seattle's baseball team's name. 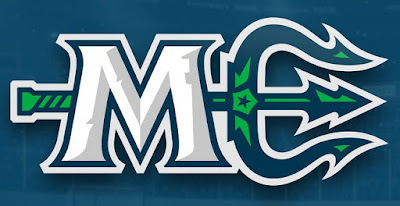 But this "Mariners of Maine" stuff is downright terrible. I've been asked by a few out-of-town friends if I am planning on going to see the Winnipeg Jets and Vegas Golden Knights play at BellMTS Place. I will tell you right now: that's a big negative. I spent some time on Friday trying to see if I could find tickets that won't prompt to take a second mortgage, but it's proving difficult thanks to the pricing that the Jets have set for this third round of the Stanley Cup Playoffs. To be honest, I'd need the salary of a Winnipeg Jet to see the Jets play. Tickets for this round of play at BellMTS Place start in the 300-level at $257 plus fees and taxes. Conservative estimates would put that cost around $300 for nosebleed tickets at the rink. If I wanted to hang out with Cassie Campbell-Pascale and Scott Oake on the 100-level, those tickets are priced at $730 plus fees and taxes. Again, let's just call it $800. In other words, it ain't cheap to see the Jets at home. That's when a few people in my social circle said, "What about Vegas?" 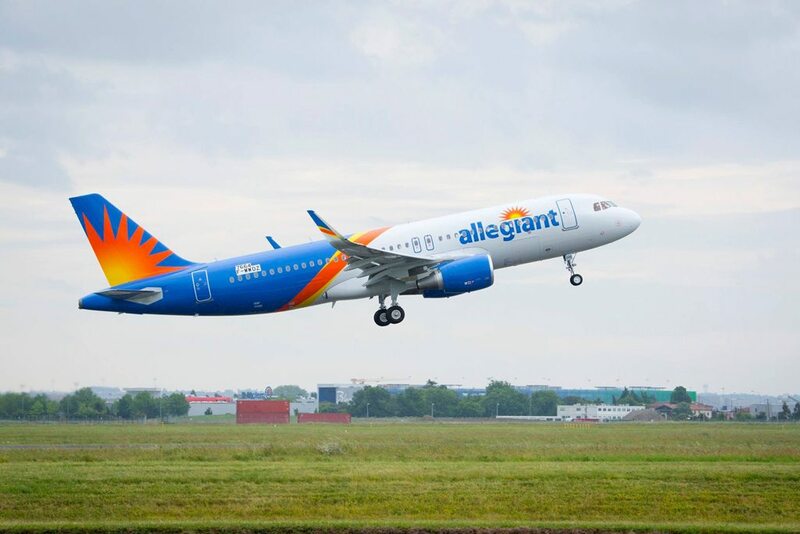 Allegiant Air, as seen in the lede photo, added a Wednesday afternoon flight from Grand Forks International Airport to the McCarran International Airport in Las Vegas with a return on Saturday. Domestic flights in the US are usually far cheaper than flying from Canada across the border, so it was worth the gamble to see if this added flight would be more economical than buying tickets at home. According to Allegiant's website, the cost for booking this flight? $660 per seat. To start. OUCH. Ok, so maybe there isn't any way to see the Jets without paying a ton of dough in this third round. I guess the $300 for the upper-deck tickets might be the most economical choice if one wants to watch the game live and in-person. For now, I'm fairly happy watching the game from my couch with cold beverages in the fridge, good food nearby, no line-ups for the bathroom, and, if needed, a change of clothes in case there are nachos or other food spilled. I'm not complaining about the accommodations since the mortgage payment I'd need to spend on a ticket can actually be spent on my mortgage! While season ticket holders spend far less than what the walk-up crowd does, True North Sports and Entertainment is clearly making truckloads of money in these playoffs! Go Jets Go!